Menu Printing - Dine-In & Take-Out Rush Menu Printing Online at 24 Hour Print! Among the promotional tools that can help you to market a small or starting restaurant, café, or pizzeria are menus. You can choose to print dine-in or take-out menus. Both are important and can give more foot traffic to your business. Print classy, high quality dine-in menus that you can show potential customers looking for a place to eat and give-out take-out menus so they can experience the same gastronomical pleasure even when at home for delivery. Dine-in menus come with lamination to make them durable and easy to clean. You don’t have to worry about stain getting into your menus and these won’t be easy to fold. On the other hand, your take-out menus should be more portable so you can easily hand them out to every take-out and delivery customer. You can give them out like flyers which they can fold to fit their pockets and take to their homes. 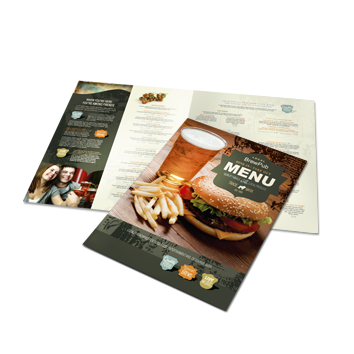 Here at 24 Hour Print, we offer restaurant menu printing; both take-out and dine-in menus. Our menu printing services includes different options to suit your needs. Our take-out menus are available with folding for better presentation. We use 3mil gloss or matte sealed lamination for dine-in menus to protect it from every day wear and tear as well as make it look elegant. Rush menu printing is available. Our take-out menu printing is available with 2-day and next day printing turnaround at minimal costs. Plan your order in advance and you can get the standard 3-day turnaround without additional cost. Our dine-in menus have a standard turnaround time of 6 business days. Should you need more information, you can call us at 1-844-380-7056 or launch Live Chat.